So, when Kraft Canada challenged me to come up with a delicious holiday recipe featuring everyone’s favourite couple, Kraft Peanut Butter and Baker’s Chocolate, I decided to put a new twist on my old favourite by turning it into a peanutty, chocolatey treat. And the resulting Peanut Butter Chocolate Cracker Brittle was absolutely addictive! With just a few ingredients and less than fifteen minutes, you’ll have a full pan of decadence for your next holiday gathering! I chose Ritz crackers for this recipe because I thought their buttery texture would blend well with the creamy peanut butter, and I was right! But there are plenty of other crackers that work well in this recipe too; soda crackers are another one of my personal favourites. The toffee flavour of the treat combined with the flavours of peanut butter and chocolate is so delicious and even though I still love the original brittle, I’m sure I’m going to be making this chocolate and peanut butter variation just as often! If you’re looking for even more great Peanut Butter and Chocolate Recipes, make sure to check out the Kraft Canada What’s Cooking website! Quite a few of the website’s recipes are ones I make every holiday season and others, like the Chocolate Peanut Butter Swirled Bark, I can’t wait to try! And if you want something that’s pure chocolate decadence, then drop everything and make this Foolproof Chocolate Fudge right now! Of course, make sure to also whip up this quick and easy recipe, though .It’s so easy that you may just find yourself making it all year long instead of just during the holidays! A perfect holiday treat with a decadent blend of peanut butter and chocolate flavours. Line 9x13 inch baking pan with aluminum foil. Place crackers in bottom of pan, layering to cover the bottom. In small saucepan, combine butter, brown sugar and half of peanut butter. Bring to a rolling boil. Pour mixture carefully over crackers. Bake for five minutes. Cool completely. Meanwhile, melt chocolate and remaining peanut butter in small saucepan. Pour over cooled crackers to cover. Sprinkle with chopped peanuts. Let cool completely in refrigerator. Break into pieces and serve. That looks delicious! I love that it only takes 15 minutes to make! Yum! I love how easy and simple this is! I would never have thought to use Ritz in baking! Looks so good! Will definitely have to try and make this before Christmas ? OMGosh, I will be trying out this recipe!! This sounds so delicious. I love these flavours together! I saw a YouTube video with a similar recipe and it looked very tasty. Nice gift for someone as well. Mmmh, this sounds good. I haven’t made this in ages. Peanut Brittle is one of my favorites already, now add in some chocolate chips and there is an epic win. I can just tell I would totally love it! Each year I see this recipe and say I am gonna try it and never have yet!! Maybe this year is the year??!! I like that this is so quick to make, and that it uses ingredients most of us have on hand. great recipe.I have all the ingredients , will have to try making them! I will definitely be trying this out soon!! I need to try this it looks amazing!! Wow,just 15 minutes…I will definitely be trying this out soon! My daughter loves baking & trying new recipes PLUS she just mentioned making a brittle! my first thought was hmm weird my next thought was must make now… proof that while first instincts are valuable they aren’t always trustworthy! This sounds and looks like such a delicious recipe that I have saved it to my favorites. I know, that at some point, I will probably make it. Thank you for this recipe. Do you have Nutrition information? Do you knpw Carbs per serving? Hi Paulette! 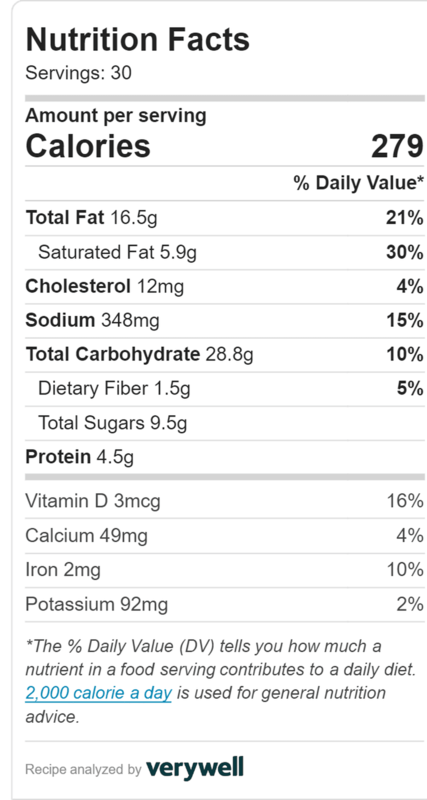 I’ve added a nutritional label to the recipe for you. 🙂 Carbs per serving would be 28.8g. Hope this helps!